Rita’s Corruption is growing even more powerful. Her wave of evil is spreading through the Morphin Grid and turning even the Power Rangers into her evil henchmen. 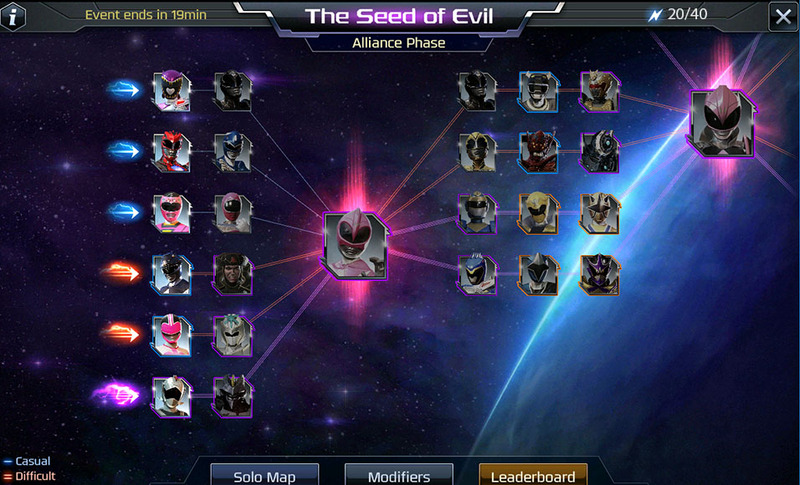 Battle in the new Raids feature against AI Heroes, Villains, and even Megazords! For the first Raid, harness Rita’s Corruption and use it against your opponents by battling with villain teams against all the fighters in the game. Raids are PVE style (Player vs Environment), time limited in-game events. During a Raid event you can select Nodes based on their difficulty level. You will fight against AI opponents that have increasing health, damage and difficulty as you reach closer to a Boss Node. 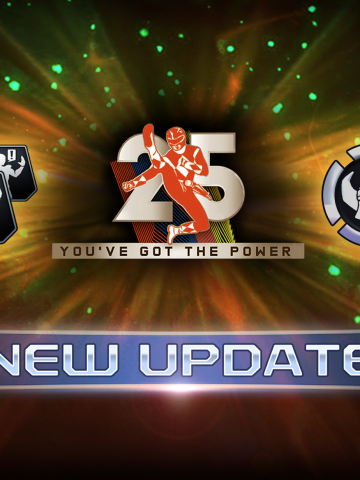 Boss Nodes are more difficult and require more damage to be done to complete! Main path Nodes will require Energy to enter. You can choose main paths based on their difficulty. 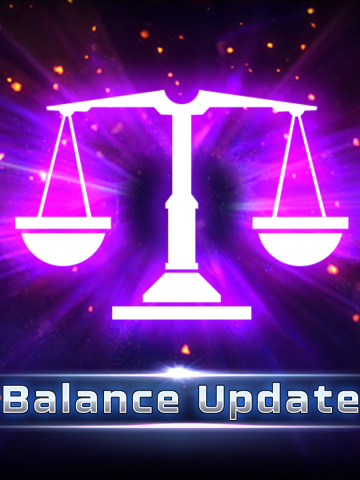 Additional side path Nodes may cost no Energy and instead have a limited number of times it can be attempted for completion. Your damage done on any Node will not reset if you are unable to complete it in one fight. 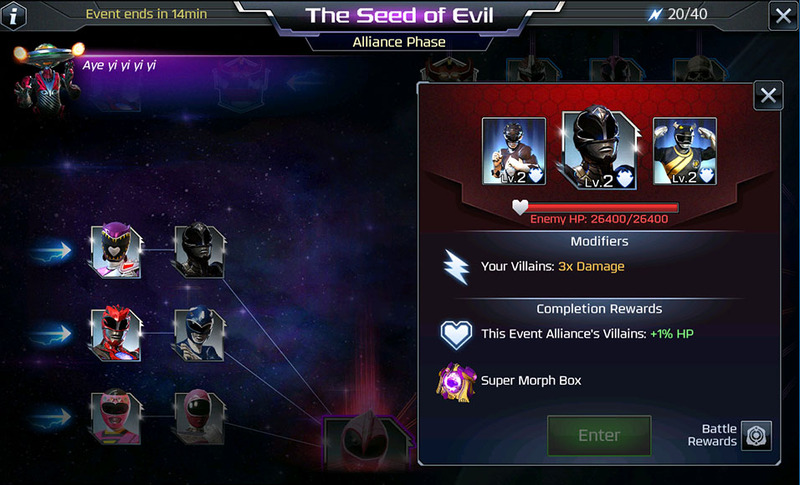 You receive rewards for each fight based on damage done and a reward for completing a Node. Leaderboards allow you to compete against others for an event ending prize! 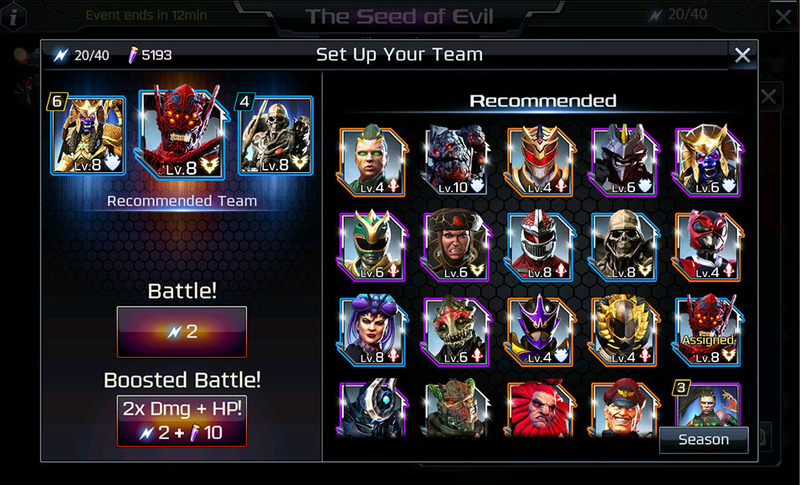 Raid events will focus on specific team compositions such as all Villains, all Heroes, etc. 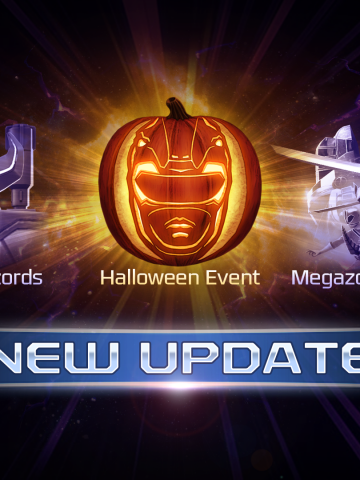 Solo and Alliance based events will be scheduled to occur outside of Megazord event hours. 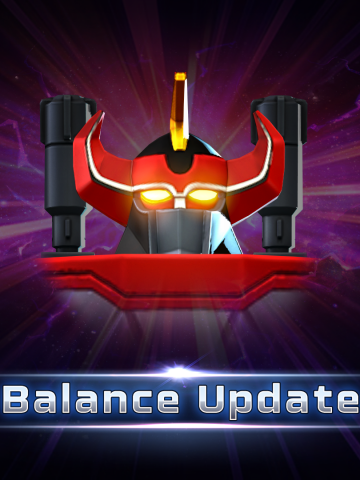 Just like with Megazord events, be sure you’re in an Alliance before the Alliance Raid event starts to contribute! How do I earn additional Energy? As with Megazords, Raid Energy can be earned from Missions, Corruption Boxes, and Free Morph Boxes that you obtain, complete and claim within the duration of the event. Warriors from your roster are sorted into the Recommended section when you choose your Team. 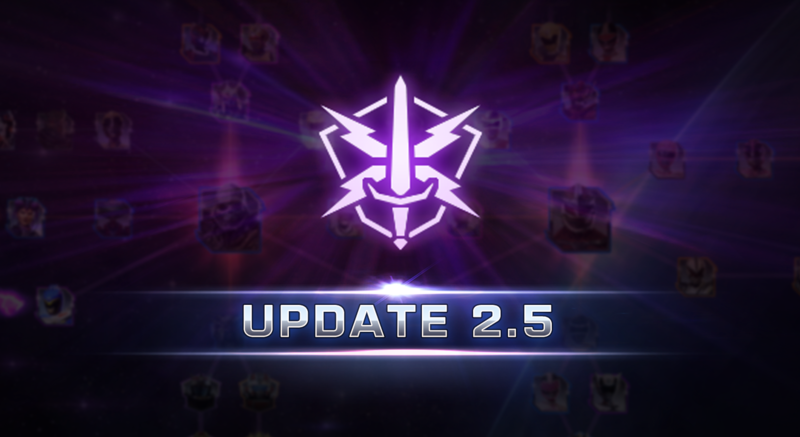 They are selected based on the Node’s Modifiers and the Warrior’s Level. Bonus Modifiers improve the strength of your Warriors with buffs such as increased damage. They may be applied to your upcoming fight or even for the entire duration of the Raid event! You can also choose to obtain additional individual fight Modifiers by selecting the Boosted Battle option before entering a fight within a Node. What types of Bonus Modifiers are there? Node Modifiers: These only affect a fight taking place on that Node. Solo Phase Modifiers: These are given as rewards for completing Nodes. 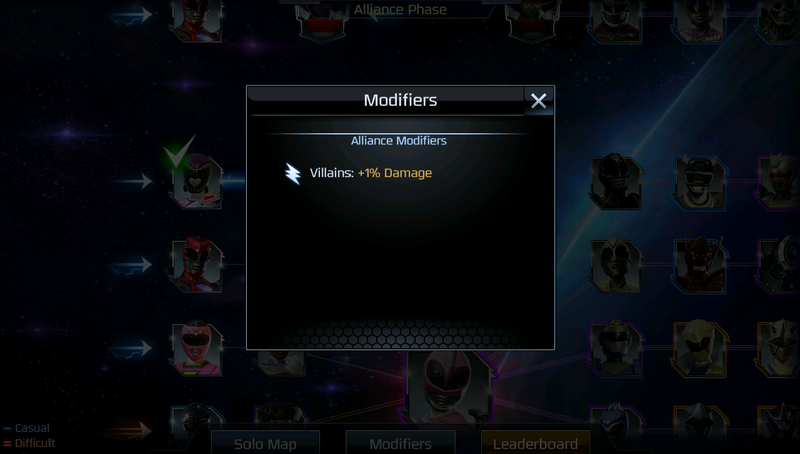 Event Modifiers earned in Solo Phase carry over to the Alliance Phase. Alliance Phase Modifiers: These behave the same as Solo Phase Modifiers, except that they apply to all members of the Alliance. Next Fight Modifiers: These are occasional rewards for completing Nodes in the Solo Phase. They will apply only once, and only towards the very next fight in the Solo Phase. These do not carry over to the Alliance Phase. Boosted Battle Modifier: This is a modifier that can be activated by the player in exchange for crystals for a single fight. The crystal cost goes up every time it is used in a given Phase. The cost resets when a new event or phase starts.